Chicago-based Stewart Cherlin has written several articles for the KlezmerShack. E-mail Stewart Cherlin. Chanukah 1997 Jewish music roundup, originally published in the JUFNews, Jewish Federation, Chicago, December 1997. Jewish music has a long history of borrowing stylistic elements from surrounding cultures. This is the case from the earliest liturgical chart to today's music. 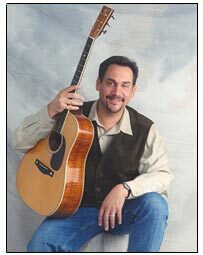 Rabbi Joe Black, a contemporary example, draws from the American folk and pop tradition. His recent CD titled "Leave a little bit undone" is a rewarding musical experience. One hears sweet incantations in "N'Kavim N'Kavim" reminiscent of James Taylor. N'Kavim is based on the prayer thanking G-d for giving us a body that is a finely balanced network of "openings and closings". The musical setting begins with an uncomplicated guitar accompaniment and follows with heartfelt devotional text. Black sings to each listener as a cantor and a rabbi, spiritual adviser and leader of prayer. His songs are unpretentious and sincere. "Hard to leave the Holy Land" is a song written while in route from Tel Aviv to Chicago. The lyrics tell of yearning and lost in an upbeat bluesy setting. The verse, "Can't forget Jerusalem, she greets you like a lost friend" expresses the connection to the Jewish spiritual homeland that ever leaves one being. The music of Rabbi Black melts away barriers of time and place. His music transcends song; it soars towards the heavens as prayer. "I remember you" is a folk ballad based on the text from Deuteronomy 5:3-4. Black stresses "We need to get beyond that which separates us and concentrate on the wonder that we are connected by a moment in time." The musical setting is personal and poignant. Black's approach is accessible, his music enjoyable. He accomplishes his aspiration of making the most of the moment. One can imagine Rabbi Black standing on a bimah (altar), or concert stage singing his songs; location is irrelevant, expression is paramount. For Rabbi Black, the where is less unimportant than the sense of presence and awe his music imparts. Black extends a sincere voice to G-d, we experience its beauty. Copyright © 2003 Stewart Cherlin. All rights reserved. This page is maintained by Ari Davidow. Send me E-mail with any comments or suggestions. All rights reserved. Last revised 31 January, 2006.